Bonjour is a utility program that is integrated into some Apple programs. It is usually used by iTunes to find shared music libraries, AirPort Express devices for streaming music to and to find Apple TVs. Safari also uses Bonjour to find devices advertising web pages on your network. It is usually installed automatically when you install iTunes and it runs a process that starts up and runs in the background when you start your system. All of this is done in the background and, a lot of the time, you don’t really know that it’s there. Can I Uninstall Bonjour and Still Use iTunes Normally? If you ordinarily use any of the services provided by Bonjour, then the apps through which you use those features need Bonjour to work. Removing Bonjour from your device will cause those apps to stop working properly. But if you don’t do anything of Home Sharing, remote app or syncing to Apple TVs, you can uninstall bonjour. iTunes will remind you once next time you open it and that will be that. It will work fine. Besides, you can also uninstall Apple Software Update if you don’t want that running. But don’t uninstall Apple Application Support because they are absolutely needed for iTunes to function. If you have any Apple software on your device, there’s a high probability that you have a Bonjour folder in your program files. It starts up automatically and runs a process named mDNSResponder.exe. This process cannot be stopped by Windows’ task manager. So if you want to get rid of it, you have to remove Bonjour. Generally, you can remove Bonjour from your Control Panel. You can ordinarily do this by going to Control Panel and clicking “Programs and Features”. Find the program called “Bonjour” and right click on it to choose “Uninstall”. However, this process may fail to completely remove Bonjour from your device and it may cause operating problems for your iTunes. 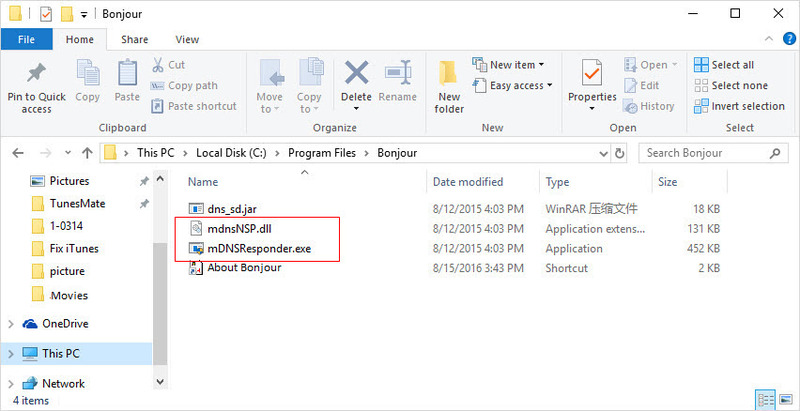 Another method you can use to remove Bonjour from your device as well as its files – mDNSResponder.exe and mdnsNSP.dll – is as follows. Step 1: On your PC, go to C:\Program Files\Bonjour. Step 2: Find the "mDNSResponder.exe" file. Right-click on it and choose "Delete". Step 3: Find the "mdnsNSP.dll" file. Right click on it and choose "Delete". Note: If you receive a notification "This action can't be completed because the file is open in Bonjour service", restart your computer and try to delete them again. Step 4: Once done, restart your computer, go to “C:\Program Files\” and delete the Bonjour folder. This process allows you to fully remove Bonjour from your device. However, it obviously takes time and more than a little bit of knowhow. There’s a better and safer way to remove Bonjour from your device in an even safer, quicker manner. Chance would happen when you failed to uninstall bonjour, or you ran into iTunes unknown errors or issues. You may find yourself no way to fix. But luckily, there is a high-tech repairer for iTunes which would save your life. iMyFone TunesFix is a comprehensive iTunes repairer and cleaner that helps you get your iTunes in tiptop shape. It is the best app for all the maintenance or cleaning work you want to do on your iTunes. 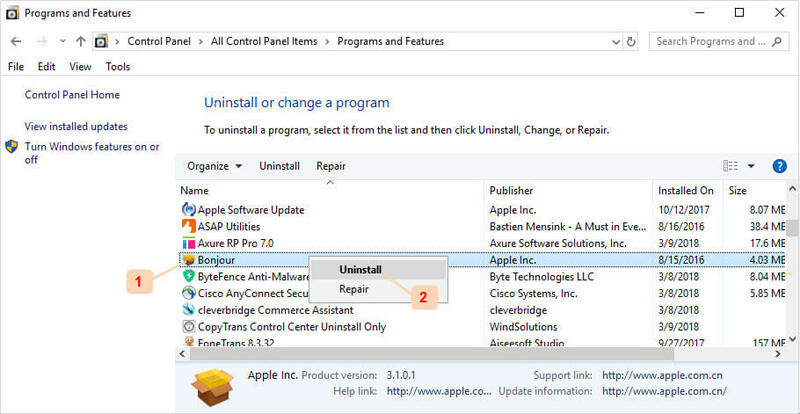 1 click to completely uninstall iTunes and related components (including bonjour) without leaving any leftovers which would cause issues. Fix various known and unknown iTunes errors and problems, like failed device connection, iTunes install/update errors, restore/backup issues, etc..
Clean iTunes data such as media files, old backups (including backups made by 3rd-party software) and used software update files either all at once or you may select as you want. Remove, in one click, all useless iTunes files like installer cache, cookies, logs and junk files to run your iTunes at optimum. Step 1: Launch iMyFone TunesFix and it will automatically detect your iTunes. If your iTunes is normal, you will be directed to the home interface. 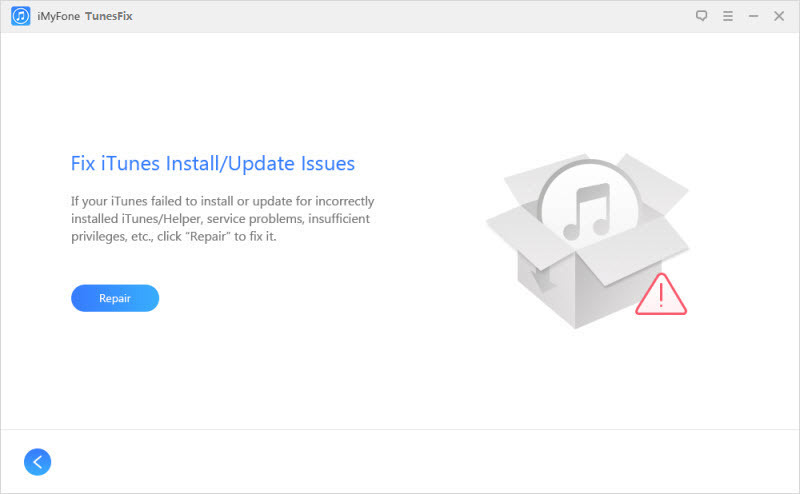 If your iTunes is damaged, TunesFix will help you repair it before directing you to the home interface. Step 2: On the home interface, you will see options such as “Quick Clean”, “Deep Clean” and “Full Uninstall”. Click on “Full Uninstall”. Step 3: If you want to delete your iTunes user data like media files, backups and software update files, check the option before you click uninstall. Then click the uninstall button. 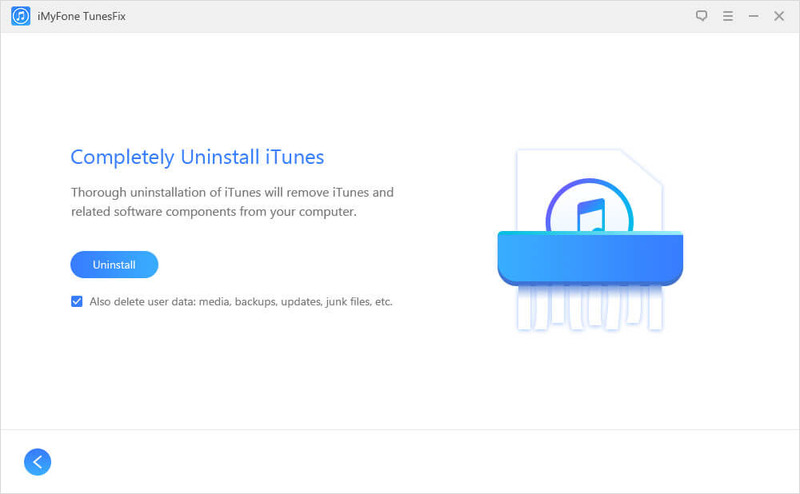 The uninstall process will begin and when it is ended, it will provide an option to reinstall iTunes. Select the “Click here” button for the iTunes download links. Besides, if your iTunes has any errors or issues, you can try TunesFix’s repair modes. It’s quick simple as 1, 2, 3. Step 1: Run TunesFix on your PC and it detect your iTunes and components. If there is issue with the components, you can click “Repair” to fix it. Once done, you can check your iTunes to see it runs fine or not. Step 2: If your iTunes is fine, it will guide you to the home interface. There you can see 4 repair modes: Repair Failed iDevice Detection, Fix iTunes Install/Update Issues, Repair Backup/Restore Errors and Fix Other iTunes Problems. Tap one mode. Step 3: Click on Repair button to start the process. It will download and install the repair drive for your iTunes. Don’t give yourself the stress of deleting Bonjour manually from your device. 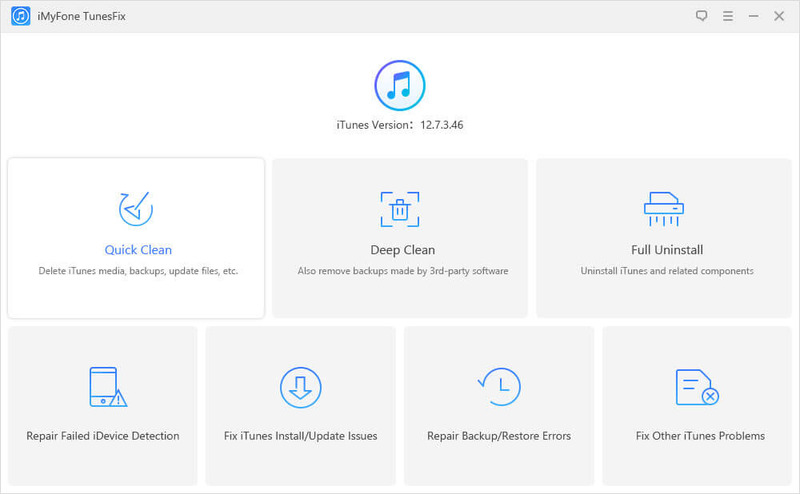 With iMyFone TunesFix, you can easily fix any issue with iTunes or completely uninstall iTunes and related components to successfully reinstall iTunes again. You can do all you want in little more than one click.